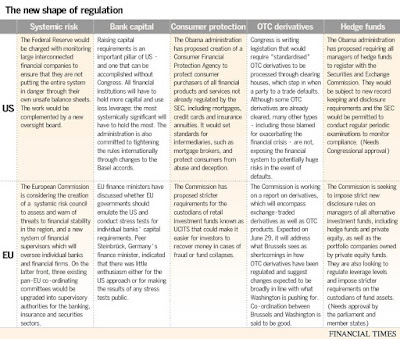 This is a great summary from the FT, showing how financial regulation is shaping up. It's interesting to see how it is categorized: systemic risk, bank capital, consumer protection, OTC derivatives, and hedge funds. Items excluded are money markets, securitization, off-balance sheet financing, rating agencies, and some other issues that may be just as critical.